Tanger Factory Outlet Centers' (SKT) dividend yield has soared from 4% in early 2017 to 7% today. Despite the REIT's track record of increasing its dividend each year since becoming a public company in May 1993, some income investors are worried about the payout's safety. Let's take a closer look at Tanger's recent struggles and assess how safe the retail REIT's dividend appears to be going forward. In business for nearly 40 years, Tanger owns a portfolio of 44 outlet shopping centers located across 22 states. Its properties have over 3,100 stores which are leased to more than 530 different companies. Most of its tenants are higher-end apparel retailers which offer discounted clearance items at Tanger's locations. Apparel retail is a notoriously challenging industry. Companies must invest heavily in inventory, labor, rent, and advertising, while consumers often have fickle tastes, chasing the latest deal or fashion trend. The rise of e-commerce and its impact on consumer shopping preferences continues sending ripples through the industry as well. The ability of mall-focused REITs to grow in such an environment has come into question, and Tanger is no exception. 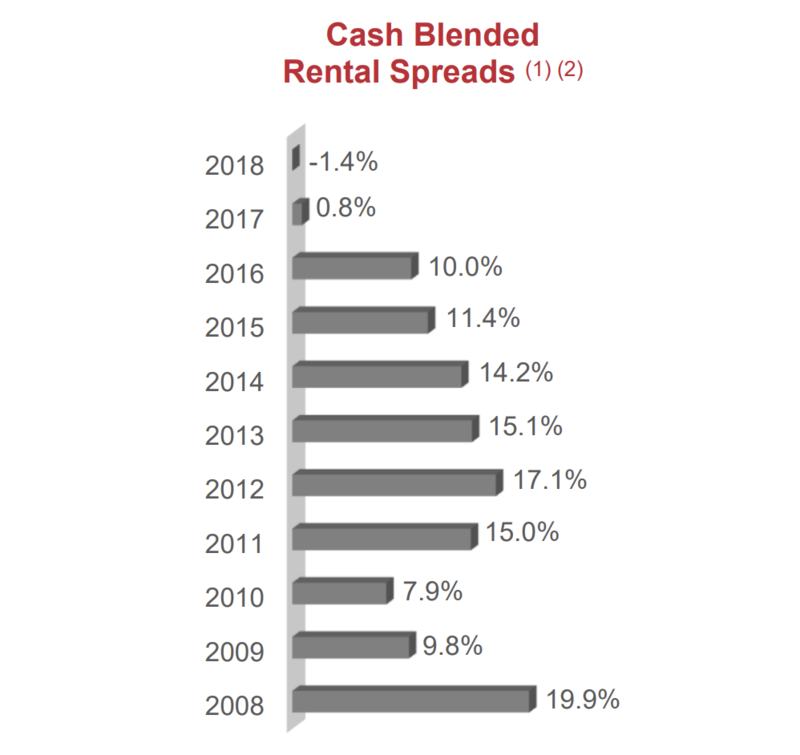 For many years, Tanger enjoyed double-digit growth in rental spreads, which measure the difference between rent per square foot on a new lease compared to the rent that was previously paid for the same space. However, Tanger's rental spread slowed to 0.8% in 2017 and actually turned negative in 2018, indicating its properties were now struggling to exert pricing power. Similarly, Tanger's occupancy rate had never dipped below 95%, even during the financial crisis. While portfolio occupancy stood at 96.8% at the end of 2018, management expects average occupancy in 2019 to dip as low as 94% for the first time in Tanger's history. This combination of falling occupancy and weak rental spreads resulted in a 1.3% decline in same-center net operating income (NOI) growth in 2018. Investors were not expecting this deceleration, which helps explain Tanger's poor stock performance since early 2017. Unfortunately, management doesn't expect improvement anytime soon. Tanger's 2019 guidance calls for same-center NOI to decline between 2% and 2.75%. 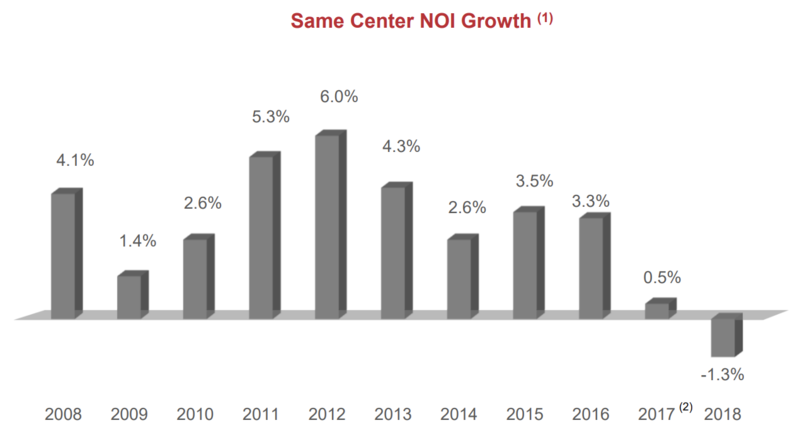 Interestingly, Simon Property Group (SPG), another mall REIT, achieved 2.3% NOI growth in 2018. Approximately 79% of its NOI is from U.S. malls and premium outlets (42% of NOI is from its value platform, which primarily consists of Simon's premium outlets). Simon expects these businesses to record 2% same-center NOI growth this year, which isn't very fast but it's significantly better than Tanger's guidance calling for a low single-digit decline. In 2018 Simon's malls and premium outlets also recorded a 14.3% increase in leasing spreads and 5.3% growth in retail sales per square foot, once again topping Tanger's results by a wide margin. What explains this variance? Your guess is as good as mine regarding the future of outlet malls. However, given Simon's continued low single-digit NOI growth across its portfolio, this type of bargain shopping seems to remain valued enough by consumers to keep the REIT's profits from quickly eroded. Instead, Tanger's divergence from Simon appears to be driven by its weaker mix of tenants. Jim Williams, Tanger's CFO, explained on the firm's February 2019 earnings call that over half of the firm's expected NOI decline this year is due to additional retailer bankruptcies, with much of the remainder due to store closures Tanger experienced in 2018 from meaningful tenants such as Toys 'R' Us and Nine West. "If you look at the midpoint, the decline in NOI is 240 basis points, about 140 basis points of that is from the expectation of the further bankruptcies, potential rent adjustments from 2019 activity. Add to that same-store NOI would be down on about 100 basis points, which factors in all these other things you mentioned, the drag from the 2018 closures and so forth." Tanger reported that its top 25 tenants generated 57.6% of its rent in 2018, and its largest tenants are well-known retailers such as The Gap (GPS), Under Armour (UA), and Nike (NKE). 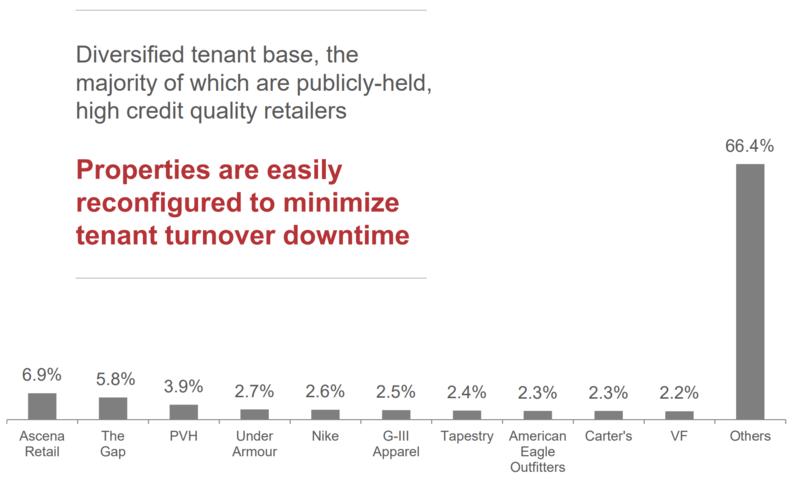 However, over 40% of its rent is generated from undisclosed retailers, many of whom are presumably struggling and focused on apparel. For example, earlier this year Gymboree and Charlotte Russe filed for bankruptcy. Both of these retailers are in Tanger's portfolio, accounting for just over 1% of its total square footage. However, neither of these customers were disclosed in Tanger's annual report, leaving investors to worry about other troubled tenants that could be the next to go belly-up. Should more tenants close their doors, Tanger's occupancy will dip and its rent spreads will struggle to hold their ground. Even though most of its stores are only 4,000 square feet and thus fairly cheap and easy to refill, it still takes time to bring in replacement tenants. Let's review what these issues could mean for Tanger's dividend safety. Even if you calculate free cash flow the old fashioned way, by taking cash flow from operations and subtracting out all capital expenditures, there appears to be a reasonable margin of safety. In 2018 Tanger generated $258.3 million of cash flow from operations, similar to its results in 2017 ($253.2 million) and 2016 ($239.3 million). With management expecting FFO per share to decline by about 6% this year, we can assume cash flow from operations will likely fall by a similar amount to reach $242.8 million. Tanger's capital expenditures totaled $64.3 million in 2018. With no new development projects in progress (an expansion to Nashville is likely several years away), spending will likely remain at a similar level. Management even guided for $36 million to $40 million of recurring capital expenditures this year. Tanger's annual dividend costs about $131.2 million, which would result in a 2019 free cash flow payout ratio of 74% and retained cash flow of $47.3 million. Simply put, if management's 2019 guidance ends up being even close to correct, Tanger's dividend should remain covered by the firm's cash flow. But what about Tanger's balance sheet? Sometimes companies with sub-100% payout ratios will still cut their dividends if they have too much debt. The good news is that Tanger's leverage metrics remain in compliance with its bond covenants. 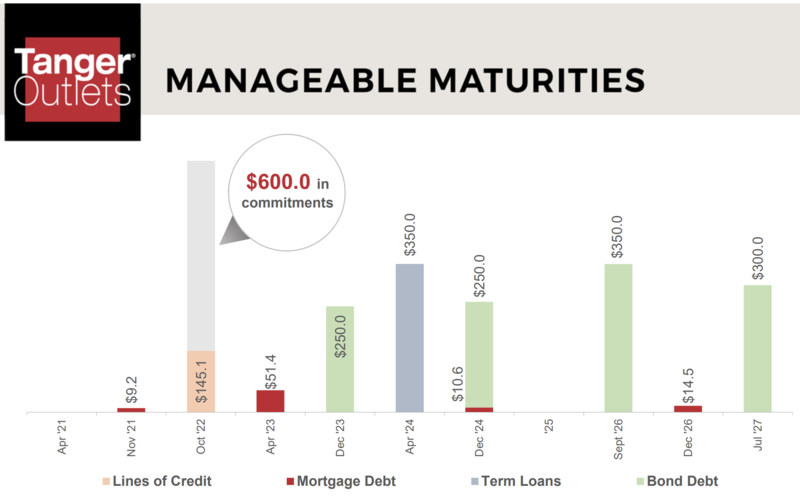 The firm also has no major debt maturities until late 2023, assuming its credit revolver is renewed prior to its October 2022 expiration. In other words, liquidity risk should be minimal for the foreseeable future. Any positive rating action would require improved operating trends in SS NOI and occupancy levels (at least 95%) with sustainability. Maintenance of its current credit metrics, with net debt to EBITDA below 6.0x and fixed charge coverage greater than 4.0x, would also be needed." Basically, should Tanger's earnings continue declining, its credit rating will likely be dropped a notch, although it would remain investment grade. Tanger's net debt to EBITDA ratio stood at 5.9 at the end of 2018, just below the 6.0 level Moody's is watching. As a result, with NOI slipping this year, management will likely need to use the firm's retained cash flow to pay down some of the firm's $1.7 billion of debt. If EBITDA declines by 6%, matching the expected rate of decline in FFO per share, management would need to reduce debt by about $100 million to maintain its 5.9 leverage ratio. That's the exact amount of excess cash flow Tanger expects to have this year after paying dividends. Basically, it's increasingly important that Tanger is not surprised by additional retailer bankruptcies, and the firm also needs to demonstrate it can renew its expiring leases at stable or higher rent rates (lease expiration schedule is below), proving its outlet-focused business model remains attractive. For now, management can continue paying the dividend. Tanger even raised its payout by 1.4% in February 2019. However, investors should not expect any meaningful growth during this turnaround. And if the environment for Tanger's apparel-focused retailers does take another leg down, then the firm's Dividend Safety Score would very likely be downgraded to a "Borderline Safe" rating. Tanger's high yield and long track record of paying growing dividends each year understandably has the stock on many income investors' radars. However, in many ways the stock looks cheap for a reason. Tanger's operating results have significantly deteriorated in recent years, driven largely by its exposure to troubled apparel retailers. While Tanger's dividend still appears reasonably safe based on the information we know today, investors considering the stock need to closely monitor the health of Tanger's tenants going forward. While additional retailer bankruptcies are already baked into management's 2019 guidance, it's hard to say whether this headwind is cyclical (a few over-leveraged and poorly managed apparel retailers) or secular (e-commerce and shifting consumer shopping preferences reducing the appeal of outlets). Only time will tell. Given these uncertainties and Tanger's weak growth profile for the foreseeable future, shareholders should make sure they remain comfortable with the size of their positions. Our personal preference is to invest in other companies with clearer paths to long-term dividend growth and equally strong or better financial health. Apparel retailers generally do not fit this mold, and Tanger's recent results demonstrate its relatively high dependency on this dynamic industry.